Urban graffiti has long been the preserve of disaffected youth, but now marketing and advertising creatives are taking advantage of its eye-catching appeal. Advertising has been ubiquitous on city streets for so long that many people simply ignore it unless it is particularly insightful or clever. Yet graffiti can draw the eye in a way that normal, everyday advertising cannot, provoking conversation and true brand awareness. Taking advantage of the structural components of its surface, this Milwaukee Riverkeeper advert created a beautiful and evocative image. 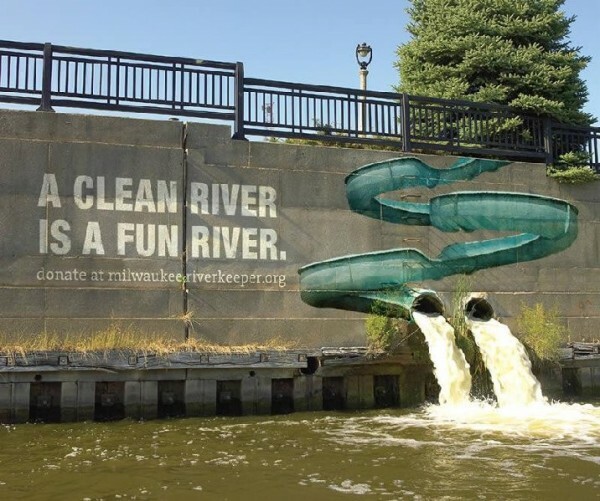 Paired with the tagline, “A Clean River is a Fun River,” the design raised awareness of the organization’s mission, soliciting for donations with a fun, creative and eye-catching image. 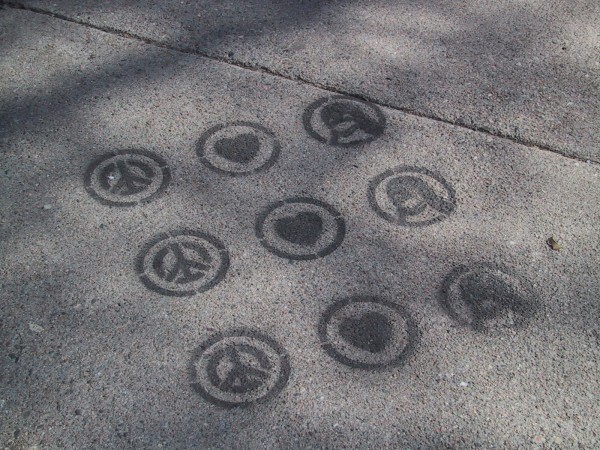 Reverse graffiti is becoming increasingly popular as a means of advertising. By using water and detergents, years of grime are washed away with a stencil, which when removed displays text or an image in the contrast between clean and dirty. It requires no permits and is not illegal as all you are doing is a bit of cleaning. 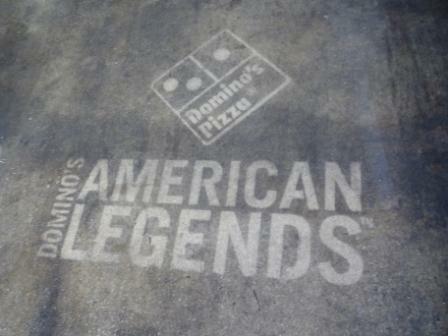 Domino’s took advantage of reverse graffiti in an effort to try out a carbon-negative, sustainable advertising campaign. All that was used to produce the images was water, carbon offsetting investment and the grime of city streets. The little running man exit sign is so commonplace that it’s barely noticed any more. 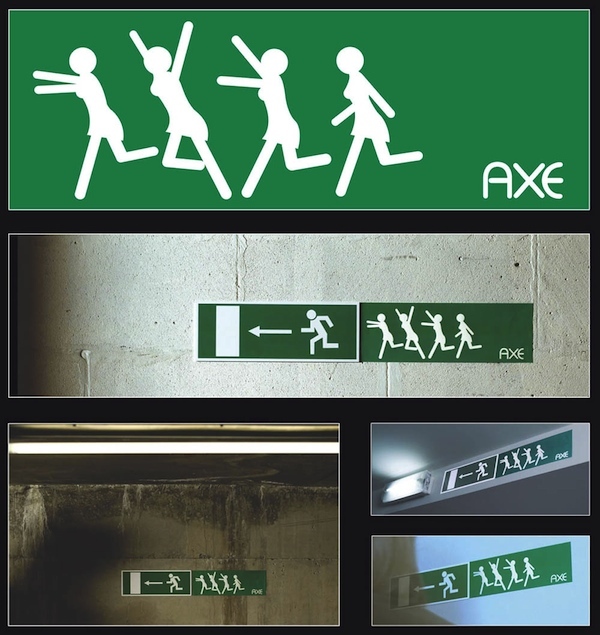 Few people have ever wondered what it is he’s running from, but the people at AXE have made it clear for us all. He’s running from the pack of lusty ladies that he’s attracted with his AXE deodorant. Any man who finds himself in the same predicament knows exactly where to go. The draw of this advertisement is in its juxtaposition with the commonplace and overlooked, so that when it is noticed, the viewer will constantly be on the lookout for more – and reminded of the piece even when all he sees is a running man exit sign with no naughty additions. A whopping 24,000 manhole covers were stolen in Beijing in 2004. This isn’t just an annoying problem for city workers; it can be a serious public safety hazard. In fact, in China in 2006, 47 people were killed and 10,000 people injured in accidents related to stolen manhole covers. 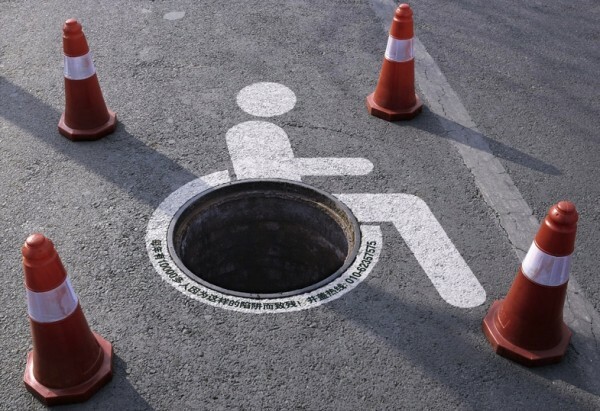 The Beijing officials drew attention to the problem by painting these handicapped signs around open manholes, placing cones to attract attention, and giving the raw statistics of death and injury caused by this crime. A hotline number for reporting the crime was then detailed. This tactic was an overwhelming success, with 190 calls received just the next morning. 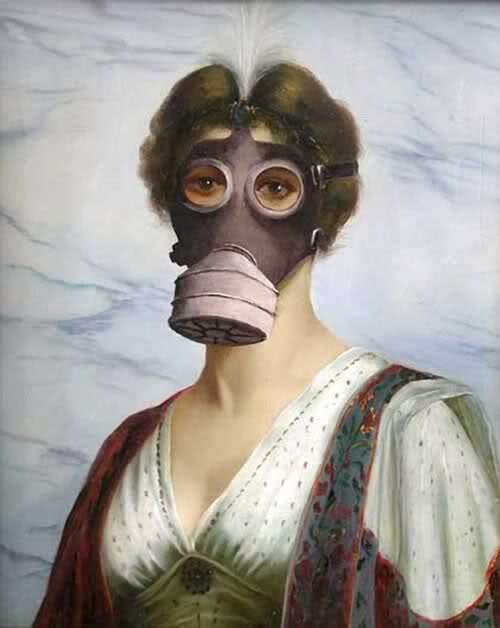 Banksy, the irrepressible graffiti icon, has never been one to do things the usual way, so when he decided he wanted some of his works in art galleries he took it into his own hands. Dressed as a pensioner, he installed his pieces in the Brooklyn Museum, New York’s Metropolitan Museum of Art, the American Museum of Natural History and the New York Museum of Modern Art. Of course, he didn’t forget to add a description and a plaque. 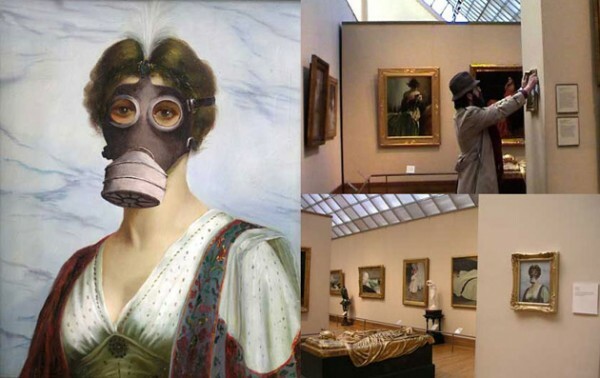 According to Banksy: “They’re good enough to be in there, so I don’t see why I should wait.” The artwork and the media interest it generated brought even more attention to Banksy’s often thought provoking work and guerrilla style of social commentary, catapulting him into the international spotlight. Since then he has had his own exhibitions in galleries around the world. 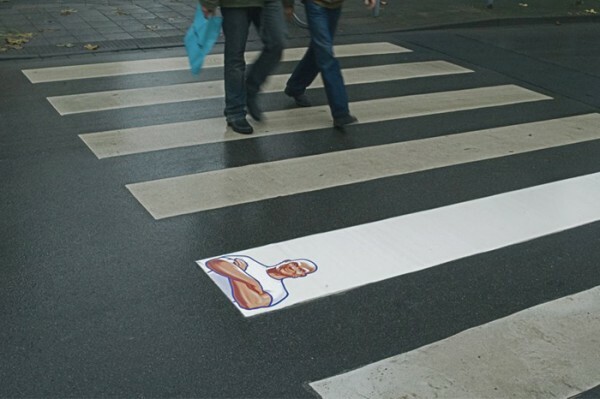 Mr. Clean has long been known for getting umpteen things clean in houses across the world. However, it seems that lately he’s taken his cleaning power to city streets, giving part of this dusty old crosswalk a long overdue sprucing up. This piece of advertising capitalizes on an already well-known brand ambassador, removing the need for extraneous text or explanation, and making a beautifully simplistic statement and clear message. It’s Mr. Clean, and he’s done what he came here to do. Green Drinks – set up as a networking and social group for those who work in the environmental field – decided to celebrate its inaugural Auckland event with this installation. The group used real grass flowers and an oil drum to depict a 3D version of its billboard advertisements. 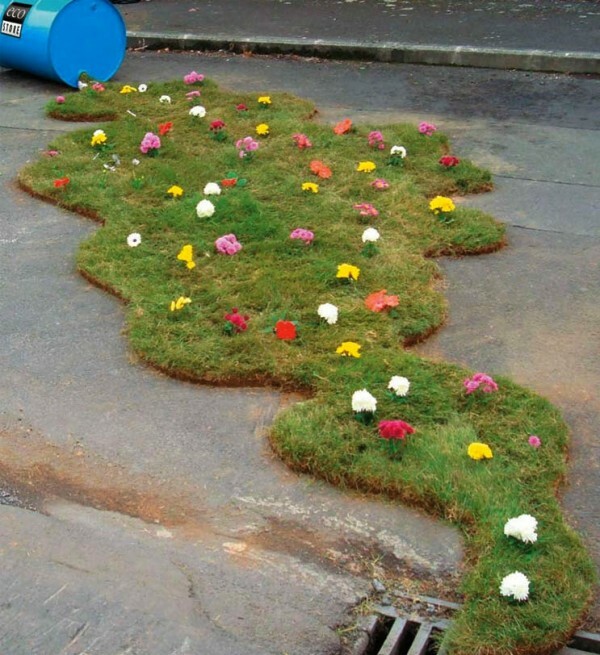 A form of guerrilla gardening – or graffiti come to life. 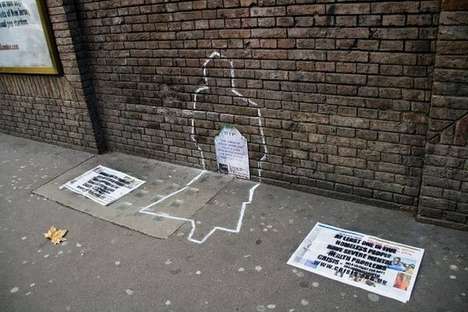 In a grim depiction of the realities of homelessness, the Alex Seo Crisis campaign drew chalk outlines of bodies on streets and walls in major cities around the world. These eye-catching images were coupled with facts regarding homelessness relevant to each urban center, to provoke discussion, awareness and action. The unusual and arresting visual drew the eyes of even the busiest of commuters in a way that traditional advertising could not have hoped for. In perhaps one of the greatest hoaxes ever committed by a graffiti artist, Marc Ecko released a video of a man breaking into an airfield to tag the US president’s plane, Air Force One. Panicked security officials checked the plane, only to find nothing amiss. 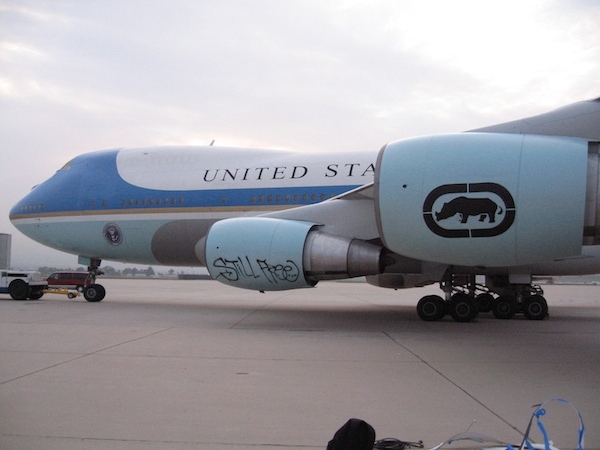 Ecko had in fact repainted a Boeing jet to exactly replicate the president’s aircraft. Reported by CNN, ABC News, USA Today and countless other news outlets, this really is guerrilla graffiti advertising at its best.